A Mexico fan cheers before the start of the Brazil 2014 FIFA World Cup qualifier between USA and Mexico at Columbus Crew Stadium in Columbus, Ohio, September 10, 2013. Mexico fans cheer before the start of the Brazil 2014 FIFA World Cup qualifier against USA at Columbus Crew Stadium in Columbus, Ohio, September 10, 2013. A recent poll finding most Americans don’t care about this year’s World Cup says more about polling challenges than it does about interest in the global soccer tournament. That’s because the poll was conducted only in English, a significant shortcoming. You can’t get complete data on Americans’ interest in the World Cup unless you talk to people who speak languages other than English. “If you don’t get the Spanish-dominant population, you’re not going to pick up the level of Latino interest in the World Cup,” Rodolfo de la Garza, a professor of international and public affairs at Columbia University, said in a phone interview. De la Garza has studied polling among Latinos, was born in the U.S. and greatly prefers football to fútbol. “The group that’s interested is the immigrants. They organize around soccer,” he said. Among those Latinos who responded to the Ipsos poll in English, 16 percent said they plan to follow the World Cup closely — or more than three times the proportion of the rest of respondents. Leaving Spanish-speakers — and others who prefer languages besides English — out of the conversation is becoming increasingly untenable for pollsters, and not just when it comes to soccer. The number of Americans age 5 and older who spoke a language other than English at home increased by 158 percent from 1980 to 2010, to 59.5 million people, or 20.6 percent of the population. 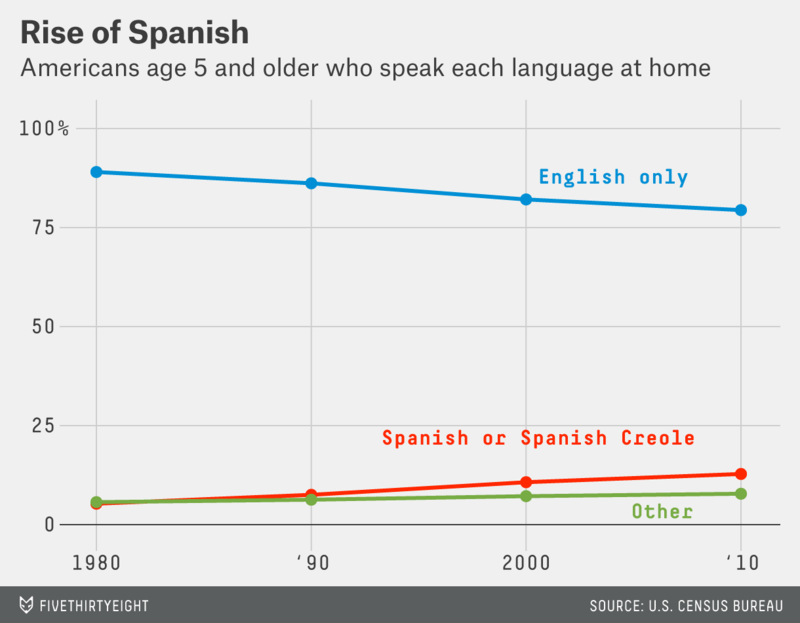 For 62 percent of those nearly 60 million Americans, their language was Spanish or Spanish Creole. Excluding people who’d only respond in Spanish doesn’t matter much when pollsters are measuring characteristics for which language doesn’t matter. If Latinos who respond in English respond just as those who don’t, then their answers suffice. That’s true even if Latinos are underrepresented in the survey, since pollsters typically weight responses of underrepresented groups more heavily. Language preference among Latinos in the U.S., or any group, exists on a spectrum. Researchers sometimes separate Latinos into three language groups: English-dominant, Spanish-dominant and bilingual. The bilingual group might choose to answer surveys in either English or Spanish. FiveThirtyEight editor-in-chief Nate Silver wrote about how polls answered by too few Latinos who primarily speak Spanish may have contributed to underestimates of Democratic support in the 2010 and 2012 national elections. Immigration is another issue for which pollsters might misgauge public opinion if they don’t survey in Spanish, survey researchers say. Latinos aren’t the only Americans whom pollsters might miss by surveying only in English. 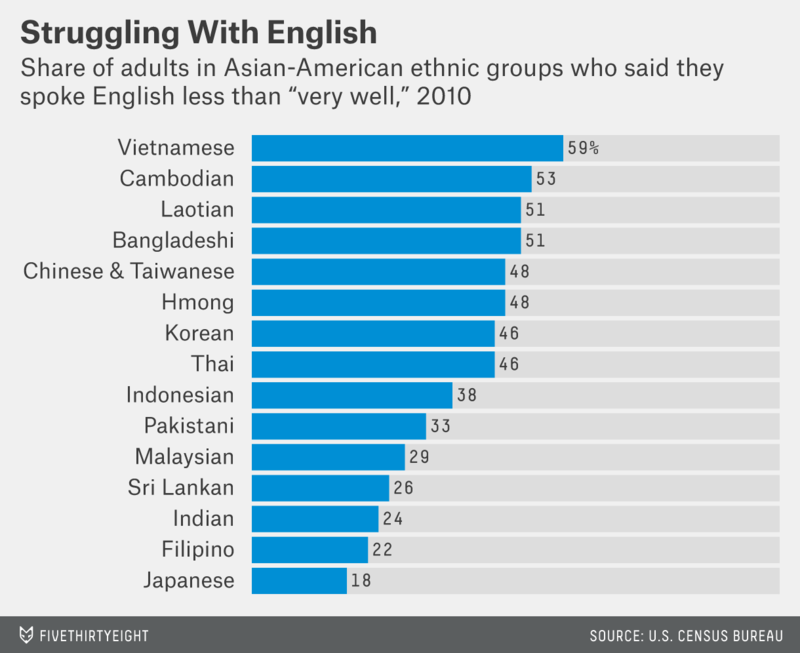 Last year Pew reported the proportion of U.S. Asian adults who said they spoke English less than “very well.”4 At least 45 percent of many ethnic groups — including Chinese Americans and Korean Americans — said that about their English skills, compared to 9.5 percent of all American adults. The American Association for Public Opinion Research, pollsters’ professional association, has no standards on including languages other than English, according to AAPOR president Rob Santos. Some pollsters decide on a case-by-case basis about Spanish-language interviews. Jay Leve, founder of SurveyUSA, said in an email that his polling firm always has offered bilingual surveys, at added cost. The cost isn’t always worth it: “In round numbers, if we are surveying an area where we know (from U.S. census) that the population is 30 percent Hispanic/Latino, we may get 4 percent to 5 percent who elect to take the survey in Spanish,” he said. The rest of Latino survey participants answer in English. Leve nonetheless insists on a Spanish option for some polls. When clients who were seeking to poll on immigration refused to pay extra for surveys in Spanish, SurveyUSA has turned down the jobs, Leve said. Soccer polls might need Spanish interviews even more than political polls do. Barreto’s estimate of 10 to 20 times is just that, but there’s plenty of data showing that soccer is far more popular in other countries than in the U.S., and therefore probably more popular among non-English-speakers in the U.S. Nielsen’s sports-media review last year showed that the NFL dominates U.S. sports viewership, but in many countries around the world — including Italy, South Africa and Indonesia — people spend more collective time watching soccer than watching all other sports combined. Another indicator of the importance of language in U.S. sports surveys comes from ESPN’s annual sports poll. The percentage of respondents who said they were fans of pro soccer, international soccer and Major League Soccer was basically unchanged from 2007 to 2013, with one big exception: a jump in each of about 5 percentage points in 2011. That was the year the poll first added Spanish-language interviews, said Juan D. Rivera of ESPN’s consumer insights group. ABC and ESPN, like FiveThirtyEight, are part of the Walt Disney Co. In 2005, ABC and ESPN bought the U.S. English-language television rights to the 2010 and 2014 World Cups for $100 million. Unlike the SSRS findings, Pew found that about the same proportion of each group was registered to vote. That discrepancy highlights a potential problem in analyzing the difference between the groups. Even with the growing number of Americans whose primary language is Spanish, they still make up a minority of any polling group. So there will be large margins of error associated with their responses, and the potential for two polls to find very different results. According to the 2010 Census.